Sparta Combat League returns April 27th to the Budweiser Events Center with their annual mega-event, Army VS MARINES 10TH Anniversary show! Come witness the epic thrill ride that will keep you on the edge of your seat as they feature their new King of Sparta tournament that stars 8 warriors who will battle in Boxing, Kickboxing, and MMA all in one night for $10,000.00 and the title, King of Sparta! 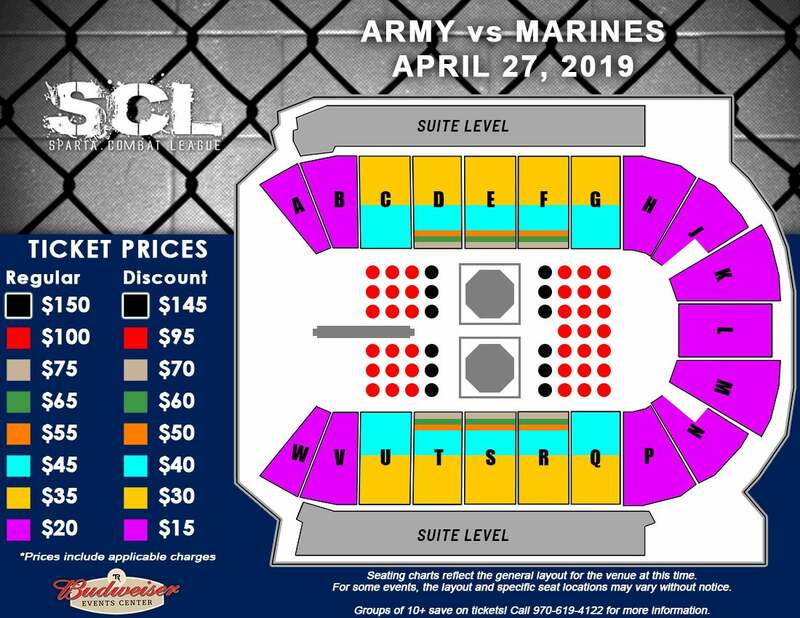 Groups of 10 or more can save $5 on tickets to Army Vs. Marines 10! Sparta Combat League began as Beatdown Promotions, a small promotion putting on Mixed Martial Arts events not only for entertainment, but also to raise donations and create awareness for those in need. In the past we have done events such as Army VS Marines (donations benefitting local veterans), Beatdown Cancer (donations benefitting families struggling to make it through cancer), and Battle of the Badges (donations benefitting injured Police Officers), just to mention a few. In 2012 Sparta Combat League was born in an effort to brand what had now become one of the fastest growing promotions in Colorado. From that point on we have continued to grow our events, both in size and credibility. We are now not known only as a small promotion, but as an ever-growing promotion with a purpose beyond just the sport. Leading the local industry in video production and quality of show, we continue to break ground in otherwise untapped fields; we are the only promotion to incorporate a charity into every event. The future looks bright for Sparta Combat League as we took our promotion national in 2015. Through mixed martial arts we are able to draw together a vast crowd of otherwise very diverse people, and unite together to support local families in need. We have expanded our database of fighters to include not just up and coming amateurs, but well-known professionals, even veterans of some of the biggest promotions in the country.